Becky Brodsky discusses environmental initiatives. Green Team members proposed lunchroom waste reduction projects and developed a film festival to celebrate Earth Day. 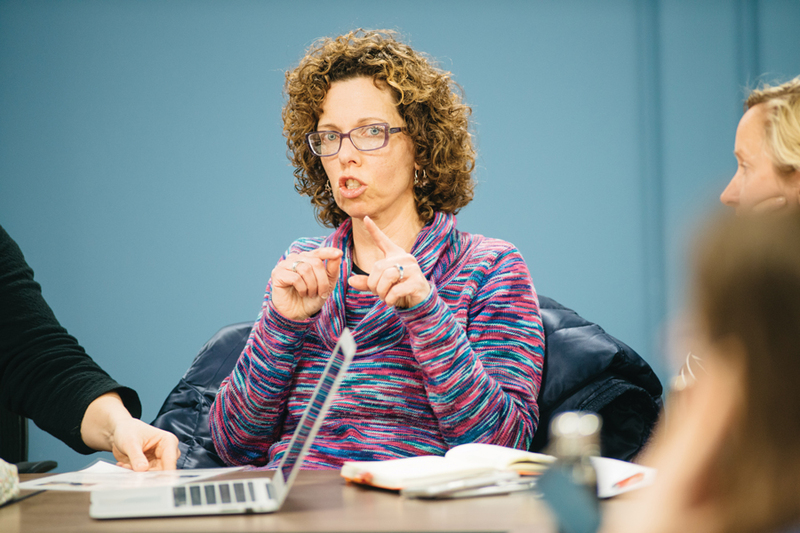 At their second meeting Tuesday, Evanston/Skokie School District 65 Green Teams members proposed initiatives to reduce waste in lunchrooms and planned a film festival to celebrate Earth Day. District 65 Green Teams representatives gathered at the Lorraine H. Morton Civic Center to evaluate the efficacy of initiatives coordinated by parents and grassroots organizations. Several District 65 schools have tested the Green Teams’ initiatives centered on lunchroom waste reduction. Wooller said they have been handing over leftover food that cannot be redistributed to students to social workers and aftercare facilities, reducing some unnecessary food waste generated in the lunchroom. She also stressed the importance of encouraging students to bring food containers to school instead of disposable food packaging. Becky Brodsky, representative from Dr. Bessie Rhodes School of Global Studies, said the Green Teams also put signs on trash bins to educate students and staff members in the lunchroom about waste sorting techniques. The signs show three different categories of waste — recyclable, compostable and landfill. After weighing the waste, Brodsky said she noticed students were misplacing a huge portion of recyclable items in the trash bin. She said this mistake is “very expensive” because landfill waste costs more than recycling and composting waste. In celebration of Earth Day, the Green Teams also plan to hold a film festival where District 65 students can submit a 10-second video showcasing their awareness of environmental issues, Brodsky said. She added that awards will incentivize students to engage in the campaign. Wooller said the Green Teams are working to incorporate the films into curriculum. She said teachers will also spend time assisting students with video ideas and carrying out the project. She added a screening of the films is scheduled for around Earth Day in April. Chad Calease, a representative of Orrington Elementary School, said the program will provide a great venue for kids to improve their understanding of sustainable development and for the school to “embed these values” into their educational environments.